The Colorado Springs clinic has been the target of repeated protests, and in recent years moved to its current location, which has been derided as a "fortress" by abortion foes. 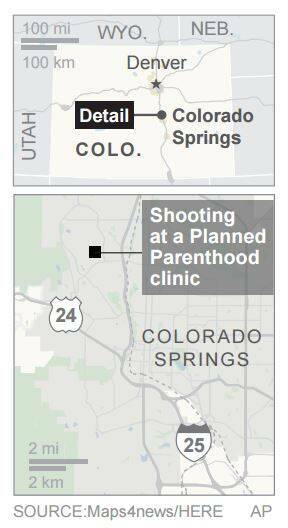 Police arrested a gunman who stormed a Planned Parenthood abortion clinic in Colorado Springs on Friday and opened fire with a rifle. According to latest reports, three people were killed, including one policeman in a burst of violence that left many civilians and policemen injured. Five hours after the siege began, the suspect was taken into custody, the city of Colorado Springs confirmed in a message posted on the municipal Twitter account. Two hospitals in the area reported receiving a total of nine patients from the shooting, but a police spokeswoman said not all of those injured could immediately be transported from the scene, suggesting some of the victims might still be trapped inside the clinic. Police swarmed the area around the building after an emergency call reporting shots fired at about 11:30 a.m. Mountain Time (1830 GMT), and officers ultimately confronted the suspect inside the building, said Lieutenant Catherine Buckley, the police department spokeswoman. Buckley said four officers had been hurt in the shooting, as well as an unknown number of other people, but there was no immediate information on the nature or extent of their injuries. She also said police had so far confronted only one gunman in the clinic, which which lies on the northwest side of Colorado Springs, about 70 miles (112 km) south of Denver. About an hour later, live television footage aired by CNN showed several people being escorted safely from the building into police vehicles. CBS News reported that a gunman fired shots upon entering the clinic, which was guarded by security, and that law enforcement officials were concerned about the possibility of explosives being involved. In an account published by the Colorado Springs Gazette newspaper, a local man told police on the scene that his daughter works at the clinic and was “in the line of fire,” to which officers replied, “We’re trying to get her out.” The suspect was armed with a high-powered rifle, the Gazette said police told the man. Penrose-St. Francis Medical Center in Colorado Springs confirmed receiving six patients from the scene. Memorial Hospital said three more were taken there. The Planned Parenthood center provides abortions, screening for sexually transmitted diseases, pregnancy testing and other services, according to its website. “We don’t yet know the full circumstances and motives behind this criminal action,” Vicki Cowart, president and CEO of Planned Parenthood Rocky Mountains, said in a statement. “We share the concerns of many Americans that extremists are creating a poisonous environment that feeds domestic terrorism in this country. We will never back away from providing care in a safe, supportive environment that millions of people rely on and trust.” Cowart said. As in much of the rest of the country, abortion is a divisive issue in Colorado, figuring prominently in attack ads during last year’s Senate race between incumbent Democrat Mark Udall and Republican challenger Cory Gardner, the winner of the election. The Colorado Springs clinic has been the target of repeated protests, and in recent years moved to its current location, which has been derided as a “fortress” by abortion foes. At least eight clinic workers have been killed in violent attacks on abortion providers since 1977, according to the National Abortion Federation – most recently in 2009, when abortion doctor George Tiller was shot to death at church in Wichita, Kansas. Hundreds of protesters picketed in front of the Colorado Springs clinic in August as part of a push by abortion opponents to cut off public funding for Planned Parenthood, according to the Colorado Springs Gazette. One man was charged with trespassing in 2012 after flouting as many as 30 warnings to keep of clinic property, the paper said Early police reports painted a chaotic picture of the situation. The city, home to the U.S. Air Force Academy and the U.S. Olympic training center, is also a hub for conservative Christian groups such as Focus on the Family that strongly oppose abortion. The attack in Colorado sent jitters across the country. The New York City Police Department reported it had redeployed some of its “critical response” vehicles to Planned Parenthood locations throughout the city. However, it said there were no specific threats to those sites at this time.